In the little town of Waterville, Maine, a small company that had been producing quality shirts for 116 years, decided things needed to change. The company, C.F. Hathaway, approached the still relatively young, Ogilvy & Mather advertising agency and asked them to develop a print campaign that would help boost their sales. It was to be the beginning of a long and fruitful association and the birth of one of the most famous advertising campaigns in the world. David Ogilvy, the creative director, agreed to take the brief. He spent days doing in-depth research on Hathaway, its shirts and its customers. He came up with 18 concepts before settling on the one he liked best. It was a campaign built around the image of a distinguished man in a series of interesting, glamorous locations and always dressed in a Hathaway shirt. Described like this it doesn’t sound that different or original. The man in the Hathaway shirt, who would be pictured in that series of romantic locations, was created to give the ads a fictional element. The ads would have “story appeal” as Ogilvy would later say. There was one more twist in the final executions, the man would be wearing an eye patch. 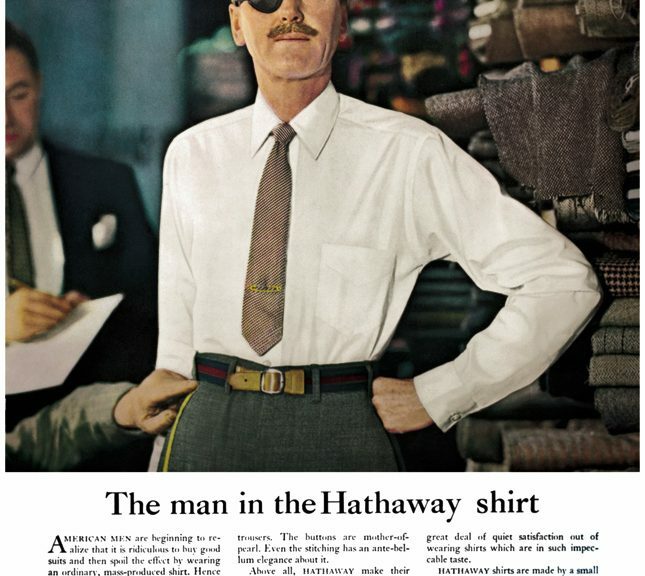 Ogilvy, a flamboyant dresser himself, got the idea to try an eye patch from a photo he had seen of Ambassador Lewis Douglas, who had injured his eye while fishing in England. Ogilvy felt the patch might be both distinctive and help dramatize the concept of an aristocratic man with a colourful life. Readers would wonder how the man had lost his eye and this would add intrigue to the story feel of the campaign. However when the photos came and Ogilvy saw the ones with the model wearing the eye patch, he was immediately sure that they had something special. The first insertion of “The Man in the Hathaway Shirt” campaign appeared in The New Yorker and cost $3,176. As well as appearing in other papers it was mentioned editorially in Time, Life, and Fortune. A cartoon in The New Yorker showed three men looking into the display window of a shirt store. In the next panel, they are pictured coming out of the store, all wearing eye patches. How much the sales of eye patches went up isn’t known, but Hathaway’s shirt sales doubled in less than five years. He wanted to grow his little business and turn it into a national brand, but he knew he didn’t have much money and needed to make every dollar count. He had heard about the advertising prowess of creative director, David Ogilvy, at the still relatively young agency Ogilvy and Mather. Jette felt that if he could only get Ogilvy to take the account, he and his company, C.F. Hathaway, might be able to get the growth they so desired. So after thinking long and hard about how he would pitch the idea to a man used to pitching his own ideas, Jette booked a meeting with David Ogilvy. Not a bad start but probably not enough to convince Ogilvy. Jette had realised that he probably only had one chance to persuade Ogilvy and so had decided to try and give the advertising man what he most wanted. Advertising is a fickle business and the promise of a lifelong client would have been a powerful incentive to Ogilvy and a client who gave him carte blanche in creative development was unheard of, a dream come true for a creative director. Jette had done what great marketing men do. He had put himself in his target audience’s shoes, in this case he put himself in Ogilvy’s very smart, probably handmade, loafers and understood what he might want. He then offered it to him. Ogilvy was flattered and delighted with the promises. He accepted the job. Ogilvy’s subsequent ads helped transform the fortunes of the company but they would never have happened how it not been for the marketing genius and insight of Ellerton Jette.